I know that I’ve made kind of a fuss about tick data being unnecessary for volume profiling. If I had to “bottom line” the issue, I certainly think it’s true. I am positive that you can be a successful volume profiler using only minute data. But we tend to learn as we get older that truth is not the binary concept many would like it to be. In a very practical sense, it’s possible for a statement or an idea to be kind of true. Mostly true. Or even only sometimes true. Well, so it is with volume profiling (and basically everything about trading). As I have stated, I am an engineer by training and at heart. That means that I love precision, and I do my best to be precise. But precision has a price, and to be a really good engineer you have to go deeper than just designing and building precise stuff. You have to weigh the cost of precision against a multitude of other factors. A very precise design can be turn out to be a poor invention ill-suited to its purpose because of what it sacrifices in other important areas for that precision. Take the Acme Profile Pack. No it’s not an example of a “poor invention.” Not what I meant at all (ha!). I was being philosophical about trade-offs and the costs of precision at the extremes. No, it’s a fact that using minute data greatly speeds up the loading of profiles… sometimes by a factor of 10x or more depending on the amount of time and volume to be profiled. But that boost in speed comes at the cost of a small and admittedly variable degree of imprecision. 90% or more of the time, this is a profitable trade-off. At other times though, for more advanced profilers, precision pays. And thus as of today I’m offering a Deluxe Edition to Rancho Dinero members which can build profiles with minute or tick data. You can use either type to build session profiles, micro-composite profiles and composites too. You can switch back and forth at will, with only a few clicks. You can even mix-and-match. Say you want to build session profiles with tick data and composites with minute data to maximize the speed benefits of lots of minute data. Totally do-able. Take a look and decide for yourself. Ticks or minutes? With the Deluxe Edition you get the best of both worlds and you’ll always have the right tool for the job. Editorial Note: This is the second part of what could be an open-ended series. If you folks out there on the interwebs find it useful, I’ll post further installments from time to time. If you missed Part One, be sure to read it first. There’s some important background info in there. It’ll add some depth to what comes next. While the DTSP™ explained in Part One is a subtle but simple order flow pattern, the ES Toilet Paper Toss (TPT™ for short) is more complex, develops more slowly and must be assessed in the context of multiple days’ worth price action and sentiment evolution. Get it? Yeah, figured you would. Before going further I am going to wax on about market context a little as I am taking a giant step in complexity from Part One to Part Two. And with this pattern the stakes are considerably higher. If you’re saying “ugh. just gimme the goods,” then skip a couple paragraphs. The details are down there. I won’t be offended. This is more about me than it is you. I need to know I said it, as I have no idea who is reading this. Just how I roll. Context is everything. I don’t think anyone should make a trade (act on a pattern or “setup”) without understanding the context in which it has formed. If you put on and exit a profitable trade and afterward your inner monologue that goes something like “damn, I’m not sure how that worked, but it did!”, and next you try to dismiss that vaguely distressing thought with something like “who cares? we’re in the money!” Stop trading right now. Yes, now. Close your DOM. Invest some time in studying price action, volume action and learning the contextual psychology of the market. It’s true, the market does what it does, and often there’s no way of really knowing why. But it’s not random. Fact is, what it does, it does pretty consistently. Sometimes even rationally. That’s the real Holy Grail of trading IMO. Understanding and accepting that the market behaves. Behavior is the manifestation (expression) of psychology. Understand the psychology behind price and volume action and even sudden market movements begin to appear less random, a little more rational and a lot less threatening. Even the ones intended to deceive (of which there are many). You may not like the behavior. It may not like you. It may not be what you expected. But if you are capable of internalizing and accepting the in-the-moment market psychology then you also have the tools to find your way along the behavioral trail that led price to where it is. 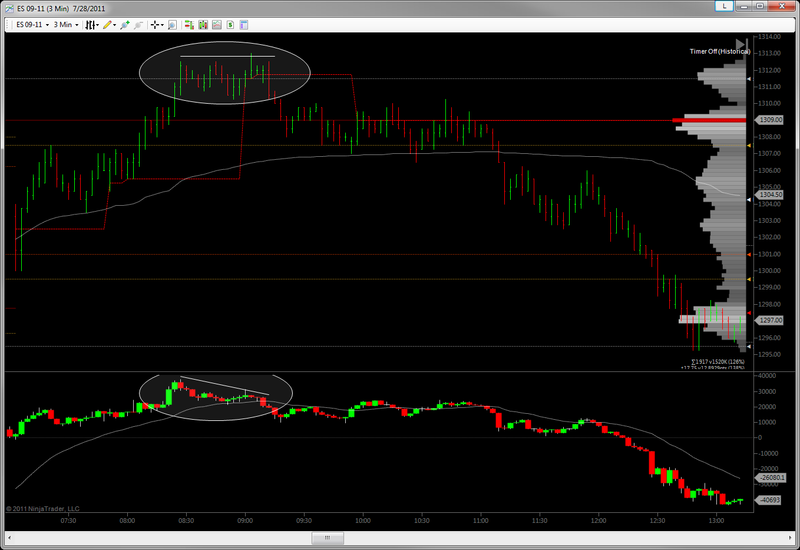 Market behavior expressed in price action, in this case then, is just a long way of saying context. Context is your friend. More importantly, I think contextual fluency is your only real edge. How do you become contextually fluent? Time and true curiosity. Start by watching and absorbing, not trading. I believe that you can’t really learn while you have risk on. It’s not a character flaw, it’s biochemical. Risk on time – time in a trade – is tactical. It’s about execution, managing your position and requires great focus. You just can’t engage your strategic (contextual) brain centers at the same time your fight or flight brain centers are active. Sun Tzu knew many centuries ago that the time to win a war is before ever engaging your enemy. So don’t try to outsmart or shortcut the ancient master. A market where assertive contrarians are not just thinking contrarian thoughts but are interested in and able to take contrarian action. In the case of the TPT, this means buyers who are willing to step in at what they perceive to be attractive, beat-down prices. Elements 1 and 2 typically present themselves during a range-bound market or a market in correction. Point is that the TPT requires price to be in a place where 2-way trade (healthy disagreement over fair prices) is likely. Conviction buying in the morning, often preceded by healthy buying during the Globex session. 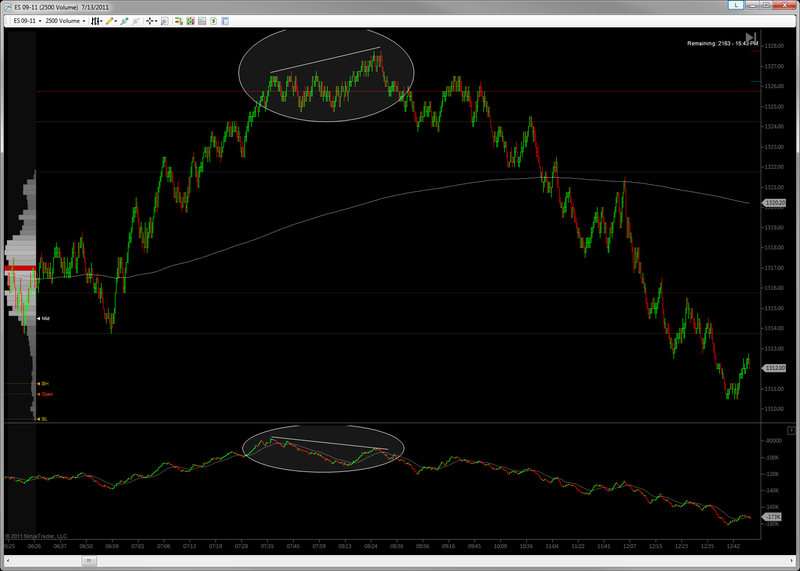 Might be new longs, might be short covering. Buying conviction that starts to visibly weaken – or assertive selling that steps in – around the time the IB high is being put in or when the European markets close, or when a significant resistance level is being tested. 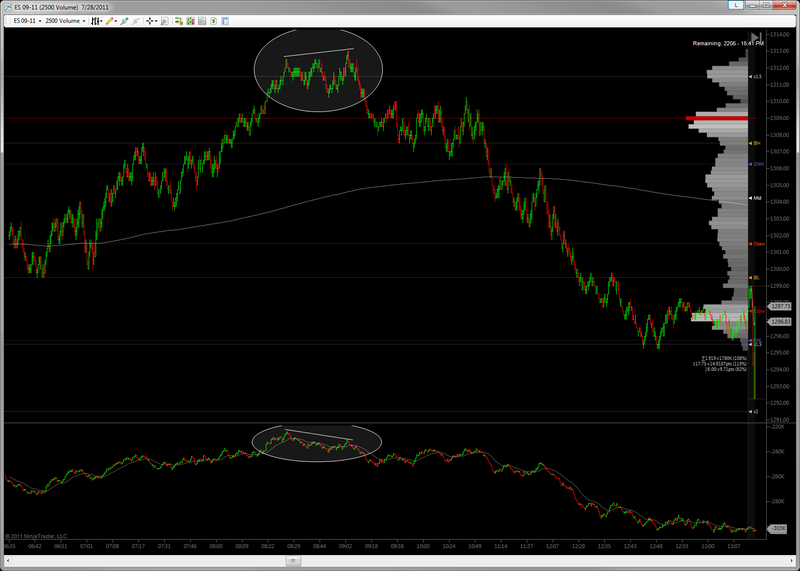 Resistance testing and IB often coincide, though not by, er, coincidence. 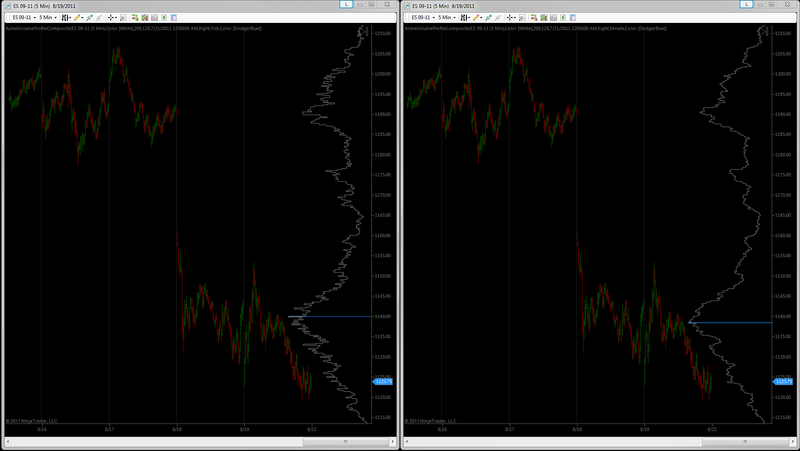 Check your intraday charts and see if you can spot something similar to what’s pictured above on other days too. Afterward, then, zoom out to the bigger picture and examine the price action in the context of the days which surround them. Can you see the elements I listed above? Once you recognize a pattern, craft a plan to trade it. Win the war before entering the battle. If you’re new to using a cumulative delta study, or you’re wondering how you might use the new indicators in the Acme Volume Balance & Breakdown Pack, have I got a post for you. If you’re not sure what I am talking about, click on the link, have a read-through, then come on back. I’ll be right here. Back already? Let’s get to it. I use AVB to assess real-time order flow. Sometimes I use it to get a feel for open interest over time frames longer than intraday, but I have yet to seriously study any correlations or non-correlations between cumulative delta-based open interest and future price action. I really don’t pay much attention to the zero line. On an intraday basis, I am not sure it means much. FACT: buyers or sellers can and do step into the market at any time, completely unannounced. AVB confirmation patterns are most useful on rotational or balanced days where there are edges to be played – or days when there is real disagreement over fair price. Said another way, I use AVB for entry confirmation, not opportunity identification. 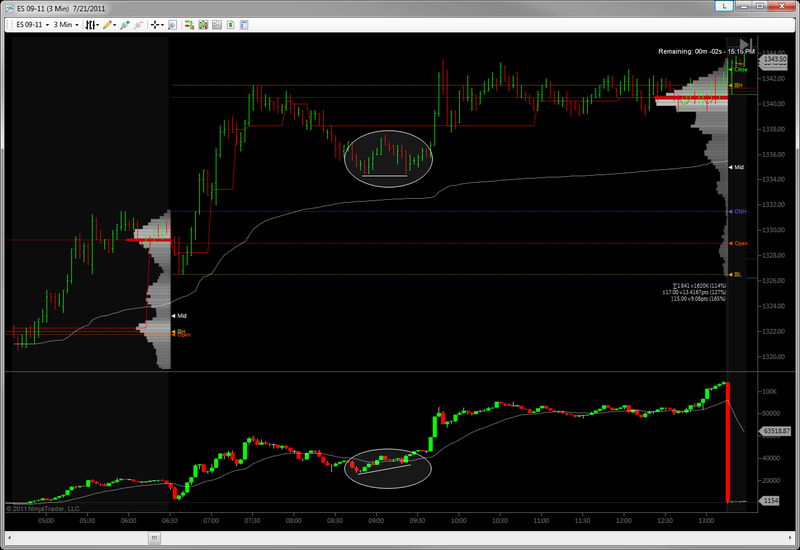 When I trade the ES, I trade price levels. When the tape approaches areas of interest, and it’s the right kind of day for using the volume breakdown, I look for price action and volume action to disagree. 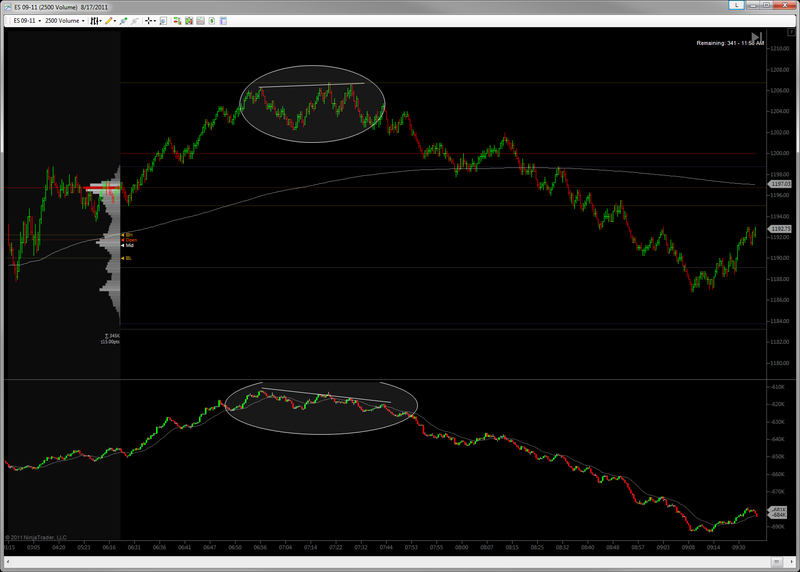 You could fairly call this “divergence.” But often it is more subtle than that word implies. Subtle though they may be, these confirmation patterns present themselves day after day if you know what to look for. Want examples? The ES is famous (infamous?) 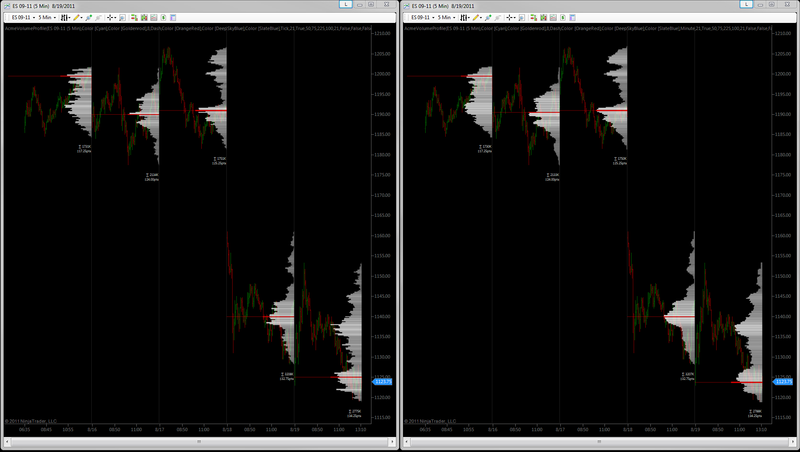 for twice-testing important intraday levels. It’s basically a subtle kind of head fake, with the aim of drawing in soon to be wrong-footed buyers or sellers. What levels are we talking about here? Well, it can occur at any level, but I see it all the time around the IB high or low, the opening swing high or low, the range midpoint, the ETH low or high, etc. In my view, the Double Tap Sucker Punch (or DTSP™ for short) is one of the most frequent and reliable behaviors of the ES. When I see a double-tap at one of the usual levels, I pay close attention to the conversation that price and volume are having. Is that a note of discord I hear? At the first price tap, aggressive buying volume goosed the tape, then let off for a few minutes to lure in some late shorts and gauge selling interest. After a few feeble candles of selling, still appearing weak and vulnerable, the buyers began twisting the throttle as soon as the mid-price was tagged again. Between the taps, buyers passively soaked up nearly all the selling, wouldn’t allow the delta back down to the previous tap’s level and in the process revealed an imbalance of intent. Hopefully this was helpful for showing you how you might integrate the Acme Volume Breakdown indicator (or any other cumulative volume study) to into your trading. Until part two… trade ’em well. I’ve released two new packs today… the much asked-for Acme Volume Balance & Breakdown as well as the Acme Trend Analysis packs. Got questions? Don’t forget to have a look through the FAQs first. Your answer just may be in there. Just a quick note to let you know I’ll be out of touch with the interwebs for a couple of days starting tomorrow morning. If you have questions or issues, please post/send/email them and I should be able to respond before the Globex open on Sunday. Mrs. Duque and I are heading out to the back 40 for the weekend. I expect to return in time for the Globex open on Sunday, so if anyone has Acme questions I won’t be able to respond until then. Trade ’em careful today… this is one of those kinds of days I don’t mind missing. Lots of opportunity, but at the same time almost anything can happen. Have a look at it here. If you haven’t already, don’t forget to check out the FAQs too. The short answer: I’m not exactly sure yet. But I have some ideas. For now I wanted to create a place to share some of the indicator development work I’ve done. 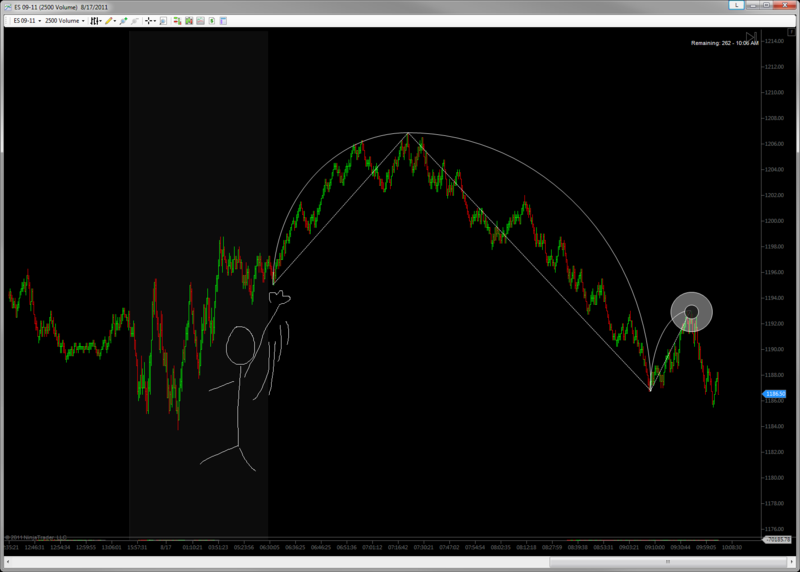 At this point that is probably the best contribution I can make to the trading community… out there… wherever you are. Giving back is hugely important. Actually, giving is hugely important. Taking is not, although it’s necessary at times. Enough philosophy. 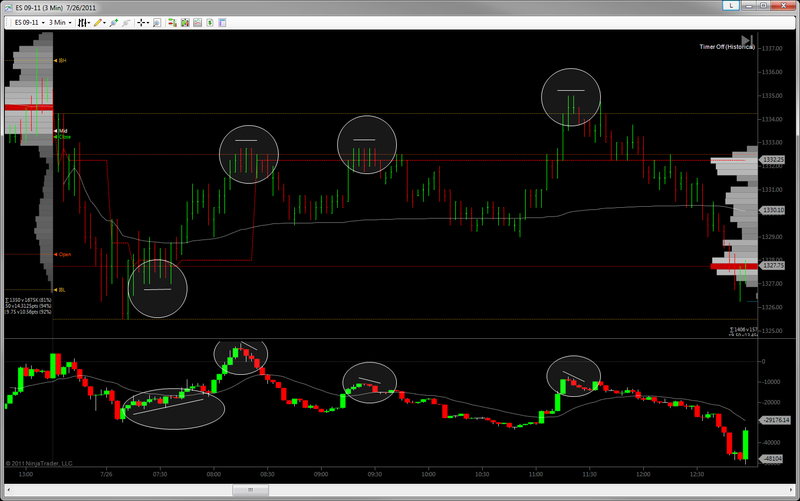 If you’re a NinjaTrader user and volume profiler (or want to become one), have a look at the indicators I’ve just made available. /wp-content/uploads/2016/03/Acme-Logo-8-2-1.png 0 0 El Duque /wp-content/uploads/2016/03/Acme-Logo-8-2-1.png El Duque2011-07-31 12:18:382011-09-29 08:33:38Where is all this going?